Being mindful and fully aware of your surroundings is important in any field. Being mindful can assist with productivity, stress, and achieving more relaxing downtime. It can help to cut out procrastination and anxiety around deadlines and being generally more on top of your work. This all sounds lovely, right? It may be easier said than done, but there are simple steps you can take to become more mindful on the job. It’s important to go in to work with a calm mind. Whether you’re working remotely or in an office, check in with yourself before getting down to business. It will set the tone of your nervous system and could affect the nature of the rest of your day. In order to be mindful in the morning avoid overstimulating your brain. Sit quietly before leaving your house or opening up your computer. Try not to look at your phone or immediately start checking your work email. Pay attention to the moment. Listen to the sounds around you, maybe a car honking outside your window, or the sound of your coffee brewing. Whatever they may be, become aware of them. Take in your surroundings. You don’t have to do this for very long, five to ten minutes is enough. Simply begin your day by being fully aware of the moment you’re in. Whether it’s a coworker who eats lunch at the neighboring desk too loudly or a testy radiator that won’t stop banging, there are opportunities for distraction everywhere. A lot of these distractions actually come from within. That embarrassing thing you did last weekend might be trying to sneak back into your mind, that bill you forgot to pay perhaps? That’s totally human and should be acknowledged. We can become more distracted by obsessing over shutting out a thought or sound than the thought or a sound itself. Instead, let them exist, and like ghosts, acknowledge and release. Notice that your mind has wandered, and then bring it back. This is a fairly easy one and it really helps with stress prevention. It can also be a helpful tool to relieve minor anxiety once it’s occurred. More often than not our breathing is on auto-pilot. We’re not paying attention to it but it’s happening. When you’re anxious your breathing quickens and becomes shallow. This can mess with the carbon dioxide levels in your body leading to lightheadedness and dizziness, two symptoms that make productivity extremely difficult. Instead, take deep inhales through the nose and long exhales through your mouth lasting about six seconds each. Taking time to focus on your breath throughout the day will help you regroup your thoughts and stay calm and aware. The more oxygen to the brain, the better. Try to notice and appreciate simple things that assist you throughout the day. For example, when you’re opening up your computer, notice your hands and feel grateful that they’re enabling you to work. Try to notice all the things that are making you feel comfortable, your chair, the temperature of the room, really anything no matter how insignificant. Taking the time to acknowledge little comforts will help you come back to the moment and will lead to mindfulness. The key to meditation, especially if you’re just starting, is keeping it short. It’s definitely a skill and it takes time and practice to meditate over longer periods. The effectiveness of five-minute meditation is great in a work environment because you’re not taking too much time out of the day. Set aside five minutes at any point in the day to take yourself to a quiet spot where you won’t be disturbed. If this is right at your desk that’s also fine just make sure there are no nagging discomforts. Relax your body, close your eyes, and begin practicing your breathing.For the next five minutes, clear your mind. You can achieve this by focusing on “being,” rather than attempting to “think of nothing.” Focus on your heart beating, your stomach grumbling, where your hands are resting, how your feet feel in their shoes. Most importantly concentrate on every breath, and if you find your mind wandering refocus it to another part of your body. Setting intentions for yourself is a helpful way to remain mindful. Don’t choose anything that feels like a chore or will cause you more stress, but things that will simply bring you back to the moment. Your intentions can even be your steps to a mindful day, i.e. meditate for five minutes, wake up mindful, practice breathing today. By setting these little goals, it will help in reminding you to be mindful and will also make you feel accomplished at the end of the day. Visual reminders will assist in staying in the moment. Whether this is a plant on your desk, a post-it note on your computer or a reminder on your phone, make sure you have visual queues that are constantly prompting you to go back to being mindful. In moments of stress or procrastination, these will help you snap back to the moment. 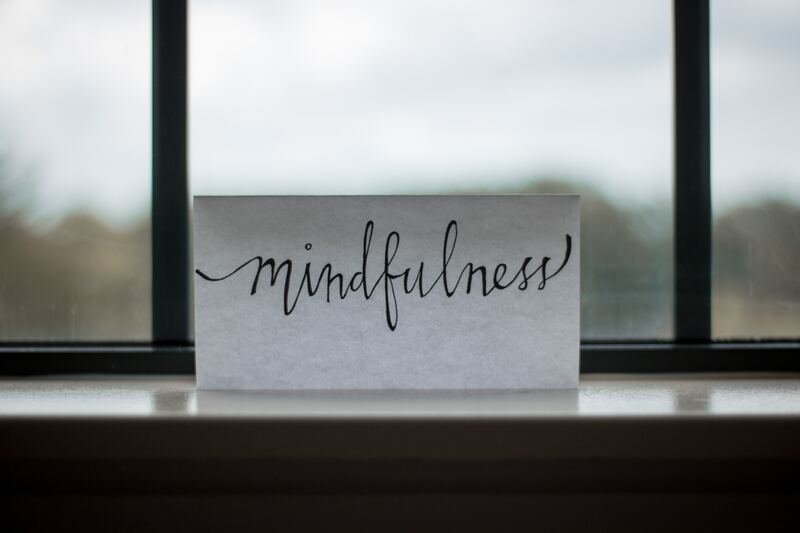 Evaluating your mindfulness at the end of the day and checking in to see how productive you were will help you set future intentions and improve your mindfulness. Take the time to really sit down and go over moments where you could’ve been more mindful and how you’ll help yourself reach that place moving forward.